Adolfo wages his own private war in Arma Virumque Cano: “Hey! You!” the man said, waving a knife in his hairy fist. Alarmed, Adolfo stared at the knife . . .
After a long interval that followed Sail Away on My Silver Dream going out of print, it’s now available again under the Wyzard Hill Press imprint–new cover, new interior, and a few minor changes in the text. I designed this cover myself to replace the World Nouveau Books design. I’ve also made a few notes towards writing a sequel. More on that later. If you ask, I’ll let you know what title I have in mind for the next book. It’s often a good idea to use an imprint name rather than your own when self-publishing. One problem with this is finding a name that hasn’t already been used. Even an inactive publisher name can result in confusion, and there are a jillion inactive publishers. Somewhere there’s a government list of publisher imprints. I’ll add it here if I can remember it. something related to book/genre eg. Yes, that’s our objective of the day: to turn your novel, novella, novelette or short into a hive of scum and villainy. Stories of any length thrive on villains. The more wretched, the better. For without him or her, there is no conflict in your story (excepting stories about the hero versus himself– tales full of inner angst, bitterness, self-doubt, flatus, etc.) Without conflict, your tale will be blah. Good antagonists make good stories, and a good antagonist is bad. The writing process, whether for novels or film scripts, has been characterized by many metaphors. Examples include building a bridge, painting a picture, hanging a clothesline, mapping an unexplored territory, opening a closet, making a sculpture, building a house, laying pipe, mining, surfing, riding a horse, and hunting. Julia doesn’t talk about it, but she still thinks of that summer as “when I learned about incense.” Many things happened between June and September that year at Benison College, but she remembers the incense most of all. Julia wanted extra spending money for her sophomore year, so she worked in town that summer, Monday through Saturday, at “Wooten’s Card Shop.” Wooten’s, known to students as “the Woo-Woo store,” sold goods ranging from greeting cards and posters, to crystals, candles, tarot decks, and Zigzag cigarette papers. One afternoon during Julia’s first week, an elderly man visited Wooten’s. He wandered about for twenty minutes, then approached the counter with a tiny box of “Dr. Gupta’s Assorted Meditation Incense Cones,” one of the least expensive items in the store. “Just this, Julia,” he said. I filed the copyright application for my latest book, A True Map of the City, today. It took from 11:07 a.m. to 11:35 a.m. Practice makes it go faster. Next step: create ARCs (advanced reviewer copies) for reviewers. Which cover do you think is most likely to make you want to open the book? (Note: ignore the red border on Cover #1). What do you think it’s about? Any suggestions are most welcome. Why inner sickness drove Hitler? Was he insane? Now Back in Print! New Cover! “J Guenther cleverly combines a plot of adventure on an imaginary sailboat with a shrewd eye on teen-age angst. In the SILVER DREAM, Sharon and David ride the waves ... to adventures where dreams are created and realized. On their journey, the two are tossed from grief to sweetness, from fear to solace and safety. Guenther is on the mark, using the main characters as narrators, unfolding parallel stories between past and present, dream and reality. 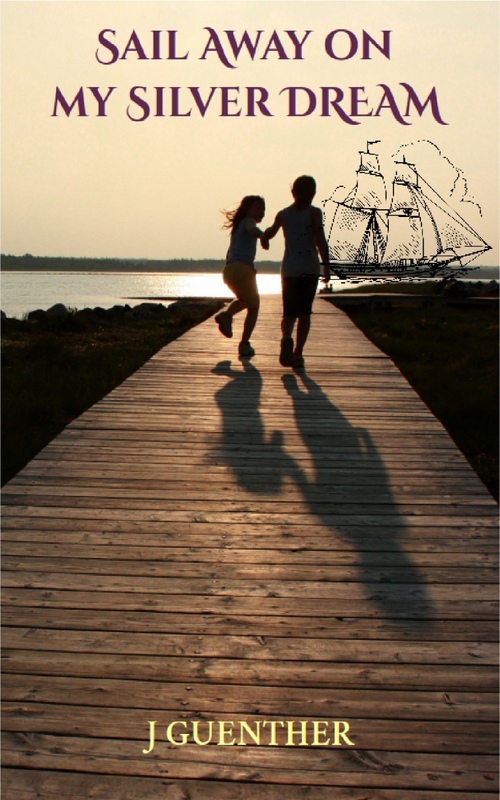 SAIL AWAY ON MY SILVER DREAM is a captivating page-turner, with a winning cast of characters.